Here is a custom wallpaper installation for all the car lovers out there. Specifically, the car buffs who love flame decals and the like. Hand painted flame decals have been used to give vehicles an edgy, hot look for years. Recently, commercial printers have been producing self-adhesive vinyl flame decals that are easy to install and are more cost effective than hand painted work. Now, take the look of flame decals off the car and get the look on your wall with a custom wall mural. The flame imagery for the wall mural can be fully customized. The look in our inspiration room is photorealistic, a close up shot of swirling flames. 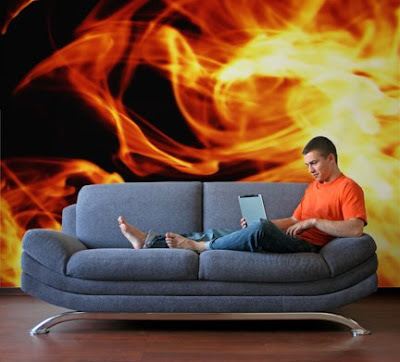 You may opt for a mural that features more graphic inspired illustrated flames. Either way, the look that you've loved on cars is now available as a wallpaper for your home, business, even the garage. With the advent of digitally printed vehicle graphics, many styles other than flames have become popular. Barbed wire, skulls, and wild line work are popular as well. Any of these inspiration points can be easily translated form a vehicle wrap to a custom wall mural. With murals printed on high quality materials, you'll love the fact that your wallpaper mural will need hardly any maintenance over the years, time you can spend working on and maintaining your automobile. Need more inspiration? Contact us for ideas and image research to make your very own decal inspired mural.